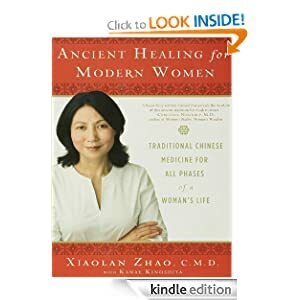 “Ancient Healing for Modern Women” by Xiaolan Zhao, C.M.D. Ancient Healing for Modern Women: Traditional Chinese Medicine for All Phases of a Woman’s Life is a wonderful blend of East meets West ideas on women’s health. Xiaolan Zhao was raised behind the closed doors of the Chinese Cultural Revolution. She was exposed in her early life to the time-honored traditions of Chinese medicine and living close to the cycles of nature. Later, she was sent to medical school and became a Western-trained M.D. Her life journey took her to practicing medicine in Canada. She became aware of the struggles Western women have with the normal stages of feminity–puberty, sexuality, pregnancy, postpartum, and menopause. This book offers a very balanced way to look at the phases of a woman’s life. It also offers traditional exercise Chinese foods and teas to ease through what we call PMS and other female challenges. The chapter on looking upon Menopause as the “Second Spring” is particularly encouraging. Xiaolan Zhao has a foot in both Eastern and Western medicine. This book offers a rare opportunity for women to educate themselves and take charge of their female health.